USS CHANCELLORSVILLE (CG 62) is the 16th Ticonderoga class guided-missile cruiser and the 12th ship in that class built by Ingalls Shipbuilding in Pascagoula, Mississippi. USS CHANCELLORSVILLE's primary mission is to operate with aircraft carrier battle groups or as part of surface action groups in extreme threat environments well into the 21st century. The purpose of the ship is to detect, classify and track hundreds of potential targets simultaneously in the air, on the surface, and under the sea. It can destroy targets using a variety of weapons: ship and helicopter launched torpedoes, deck guns, surface-to-air and surface-to-surface missiles, rapid-fire close-in weapons, and electronic jammers and decoys. USS CHANCELLORSVILLE is forward-deployed to Yokosuka, Japan, and assigned to Carrier Strike Group Five supporting security and stability in the Indo-Asia-Pacific region. November 4th, 2019 will mark the 30th Anniversary of the commissioning of USS CHANCELLORSVILLE. Feel free to browse around, learn more about us and meet some of the finest men and women the Navy has to offer. USS Chancellorsville (CG 62) was commissioned at Ingalls Shipbuilding in Pascagoula, Mississippi, on November 4, 1989. She first deployed in March of 1991 to the Arabian Gulf in support of Operation DESERT STORM. Chancellorsville next deployed from February to August of 1993, to the Arabian Gulf as part of the Nimitz Battle Group. On June 26, 1993, Chancellorsville launched strikes on the Iraqi Intelligence Center in Baghdad with nine Tomahawk missiles in retaliation for the aborted assassination attempt on former President Bush. She deployed again to the Western Pacific and Arabian Gulf from April to October of 1995. Chancellorsville deployed to the Caribbean and Eastern Pacific in support of joint counter-narcotics operations in November 1997. During this deployment, she rescued the crew of an Ecuadorian fishing vessel which had been adrift for 10 days. Upon her return home, Chancellorsville underwent her first major nine-month overhaul in San Diego, CA. On July 7, 1998, Chancellorsville changed homeport from San Diego, CA, to Yokosuka, Japan, joining Battle Force Seventh Fleet as part of the U.S. Forward Deployed Naval Force. After arriving in Yokosuka, Chancellorsville participated in multinational operations in the Sea of Japan, including the International Fleet Review. Chancellorsville took part in exercises with the Kitty Hawk Battle Group in the spring of 1999. On April 6, 1999, the Chancellorsville deployed to the Arabian Gulf in company with USS Kitty Hawk and USS Curtis Wilbur in support of Operation Southern Watch, and returned to Yokosuka on January 5, 2000. In May of 2000 Chancellorsville participated in exercises with the Thai and Singaporean navies. Following a visit to Qinqdao, China, in August 2000, Chancellorsville took part in ANNUALEX 12G, a joint U.S.-Japanese naval exercise. In November Chancellorsville fired guns and SM-2 missiles as part of MISSILEX 01-1. In March through June 2001, she visited Singapore, Thailand, Saipan and Sydney, Australia, as part of an extended Spring Cruise. Chancellorsville then entered dry dock for an upkeep period in the fall. In September of 2001, Chancellorsville deployed with the Kitty Hawk Battle Group in support of Operation Enduring Freedom, operating in the theater for several months. Chancellorsville paid her first visit to Vladivostok, Russia, in July of 2002, celebrating Independence Day in Russia along with USS Fort McHenry. On October 22, 2003, Chancellorsville played host in Guam to two warships of the People's Republic China, which made the first-ever visit of the Chinese navy to Guam. By May of 2004, she was back in the Southwest Asian region, where she lent aid to a disabled Indonesian fishing boat. On July 19, 2004, Chancellorsville departed Yokosuka to participate in the Summer Pulse 2004 and training Exercise Joint Air and Sea Exercises (JASEX) '04, with the USS Kitty Hawk Battle Group. Summer Pulse 04 was the Navy’s first implementation of the new Fleet Response Plan (FRP). She returned to homeport September 7th. Chancellorsville entered a nine-week dry dock availability in February of 2005. Following the maintenance period, she immediately returned to sea to participate in the exercises Talisman Saber 2005, the third annual Orange Crush and the Joint Air and Sea Exercise (JASEX) 2005. She returned to Yokosuka in August. ANNUALEX 2005 commenced in November with Chancellorsville participating, along with other U.S. and Japanese assets. The exercise saw a total of 61 naval vessels, including two U.S. submarines, 10 U.S. Navy ships and 49 Japanese ships. Chancellorsville visited Hong Kong at the end of November and returned to Yokosuka December 12. In winter of 2006, Chancellorsville deployed again into the Western Pacific, visiting Singapore and Pattaya, Thailand, in February. In April, she joined forces of the Republic of Korea for Reception, Staging, Onward-movement, & Integration and Foal Eagle 2006 (RSOI/Foal Eagle 06), exercises utilizing more than 70 U.S. and Korean ships. Chancellorsville returned to Yokosuka and conducted a hull swap with USS Shiloh (CG 67) in September 2006. On November 6, 2007, Chancellorsville returned to San Diego for the first time in 8 years making San Diego her homeport once again. Chancellorsville then commenced a major DSRA period from January through June 2007. During this, she received a Smartship install and was one of first ships to initiate Core Flex minimal manning. In 2008 and 2009, Chancellorsville accomplished two back to back deployments as part of the Ronald Reagan Strike Group in support of Operation Enduring Freedom. In summer of 2010, Chancellorsville and her crew successfully completed the 2010 Rim of the Pacific Exercise, the world’s largest international maritime exercise and later deployed with the Ronald Reagan Strike Group in support of Operation Enduring Freedom and Operation New Dawn. Chancellorsville directly supported Operation Tomodachi from March 11 to April 5, 2012. From April 17, 2012 to March 12, 2013, Chancellorsville completed an Extended Dry-Docking Ship’s Restricted Availability to install the Advanced Capability Build 12 (ACB-12). From March 2013 to February 2015, Chancellorsville became the premier test ship for ACB-12 and certified the baseline ensuring the system and the ship deployment ready. On May 28 2015, Chancellorsville departed San Diego to shift homeports to Yokosuka, Japan, joining Battle Force Seventh Fleet as part of the U.S. Forward Deployed Naval Force for the second time on June 17, 2015. Throughout 2015 and 2016, Chancellorsville went on multiple patrols with the Ronald Reagan Battle Group to the Western Pacific. On December 13, 2016, Chancellorsville started a 14-month Extended Dry-Docking Ship’s Restricted Availability and successfully completed the first 18-week Basic Phase certification in FDNF Japan. 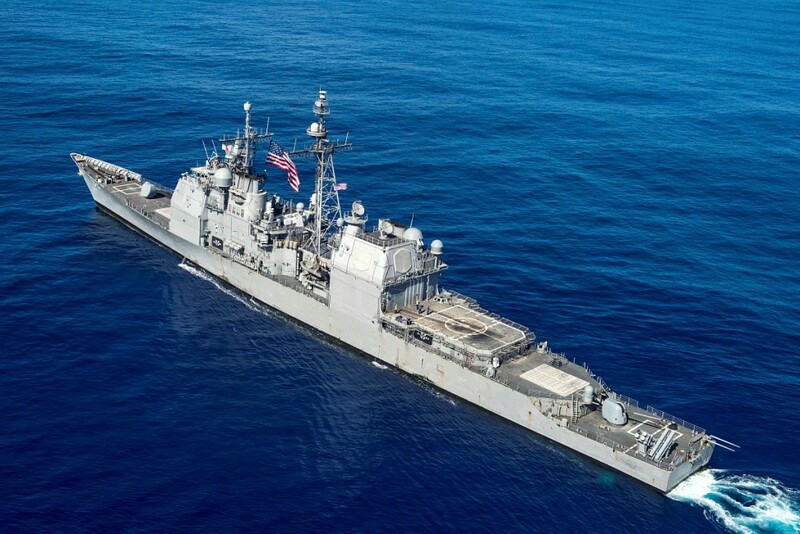 Chancellorsville was awarded the Spokane Trophy in 1996 and 2016, an award presented to the U.S. Pacific Fleet's surface ship with the highest level of operational readiness. Chancellorsville was awarded the Battle Efficiency Award in 1994, 1995, 1999-2003, and 2016. The shield's Dark blue and gold are the traditional Navy colors. The dark blue and gray refer to the colors of the Union and Confederate Armies that were engaged at the Civil War battle of Chancellorsville. The predominate gray refers to General Robert E. Lee's spectacular military strategies and his dominance in this battle. Lee's victory came at heavy cost, however, because General Thomas J. "Stonewall" Jackson was mortally wounded. The inverted wreath commemorates General Jackson's death. The embattled division and separation of the Union and Confederate colors represent the country divided. The battlements, which resemble a stone wall, allude to both General Jackson and the fortress- like quality of an AEGIS ship. The border, red for valor and bloodshed, symbolizes the Union's attempt to keep the country together. The sword stands for combat readiness; its upright position emphasizes vertical launch capabilities of USS CHANCELLORSVILLE. The bugle horn, adapted from Civil War insignia, echoes the favorite words of General Jackson in calling for soldiers to PRESS ON. The crest's trident is symbolic of sea power. The three tines of the trident represent USS CHANCELLORSVILLE's anti-air, anti-surface and anti-submarine warfare capabilities. The AEGIS shape and Civil War cannon embody new and old weaponry.